I have a somewhat unhealthy relationship with avocados: I respect and love them, but I also find them incredibly annoying. They’re kind of finicky, those little dark green buggers. You can never (or at least I can never) just go to the store and pick up a perfectly ripe avocado. Once I tried and the poor little guy had a thumbprint sized bruise where someone had overzealously gave him a squeeze. Avocados seem most perfect when I pick them up green and rock hard. A couple of days of resting time out on the counter is just what they need to become ripe but not mushy, perfectly jade green without any hints of brown bruising. When I think they’re just about good, I like to flick off their little dry stem nubbin and take a look at what color it is underneath. If it’s bright green, I know it’s good to go. If the stem doesn’t want to budge, it means that it needs a bit more time. And if it’s gross and brown underneath, it’s basically time to cry, cut off the brown bits and make some sad not-quite-right guacamole. 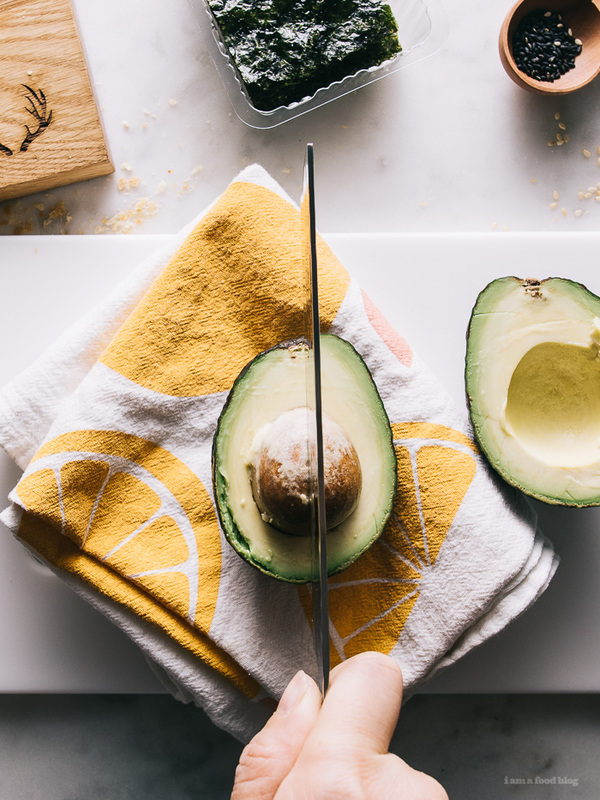 Sometimes I think if I could have a mundane superpower – you know, always being on time, always being able to find a parking spot, or always knowing when things are about to go on sale – I would pick being able to tell if an avocado is perfectly ripe and blemish free. I think that would be pretty awesome. Then again, knowing when things are going to go on sale would be pretty awesome too! What would yours be? 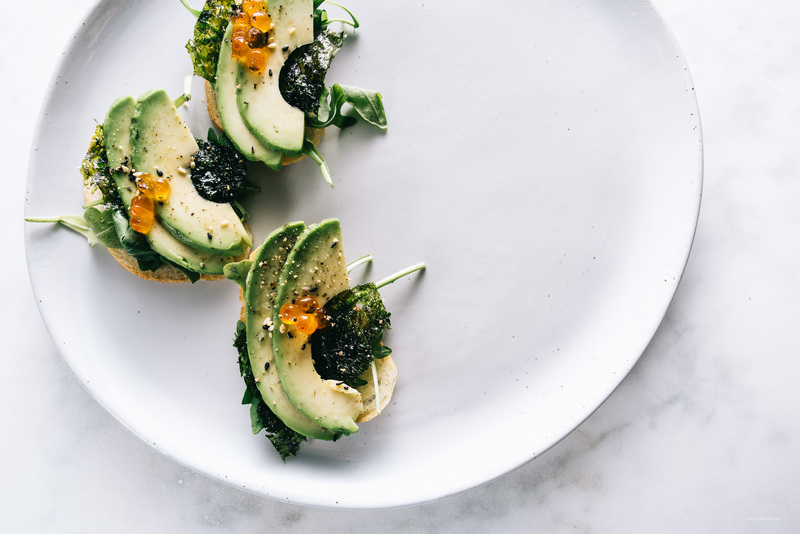 These toast are perfect when I have a sushi craving but also want avocado toast. 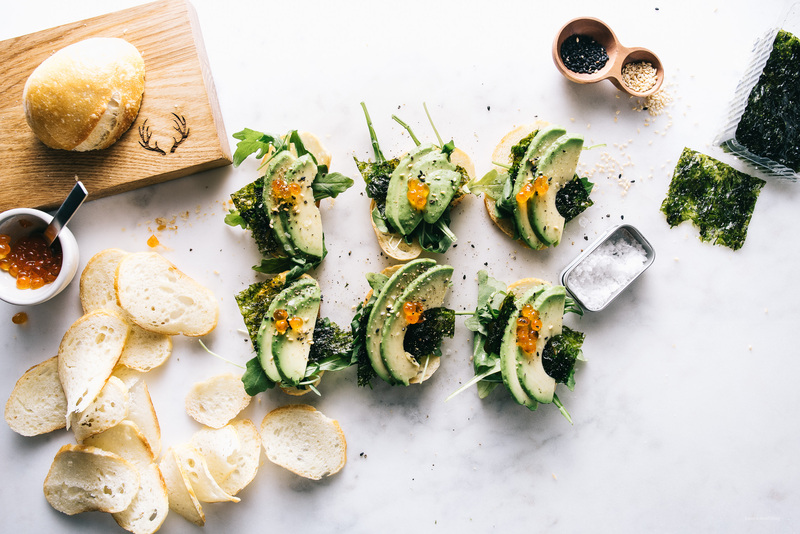 I love a crunchy toast base and the roast-y saltiness of laver pairs perfectly with creamy avocado. The salty ikura are tiny pops of brightness and the sesame seeds add a bit of nuttiness. Seriously good! 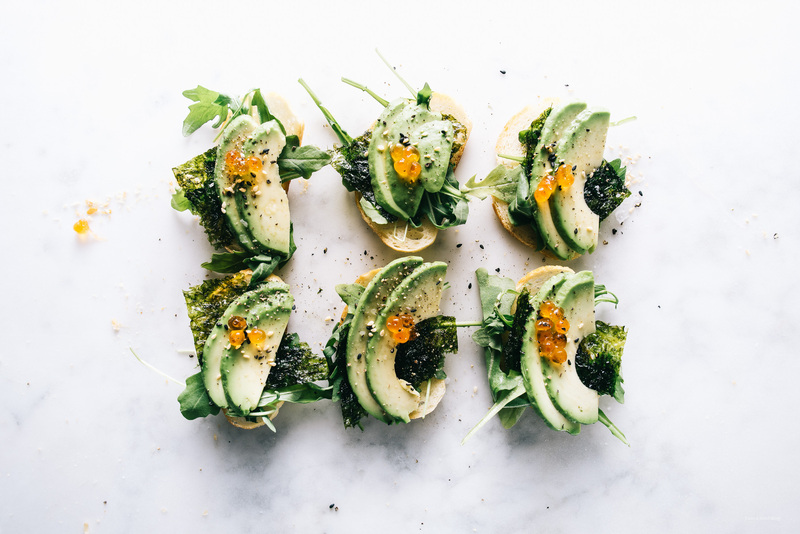 Top slices of toast with arugula, half a piece of laver, 2 avocado slices, sesame seed and salt and pepper to taste. Enjoy! This is beautiful! Lovely twist on a great classic. I love avocado toast but this?! This takes the awesomeness to a whole new level!! I love it! Love this! 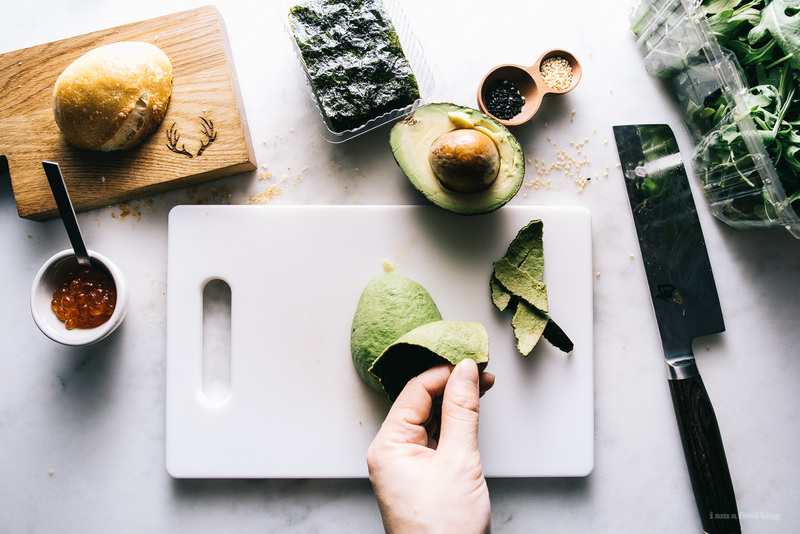 Avocados are my life, but I couldn’t agree more that they can be a bit annoying – there’s nothing sadder than a brown, bruised avo. Also love the Japanese twist, will have a go at this ASAP! Uuuhhhh drooling recipe….. You are truly my inspiration…..
Yum. The sesame seeds are perfect. 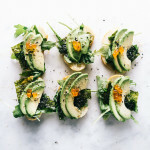 There are so many creative ways to have avo toast- love the Japanese spin! I think a sprinkle of togarashi would make this perfect! Trying tomorrow. THAT’s how people get perfect slices?? Must try rightthisverysecond! This looks amazing. Avocados are a large part of my life too, completely addicted to them! 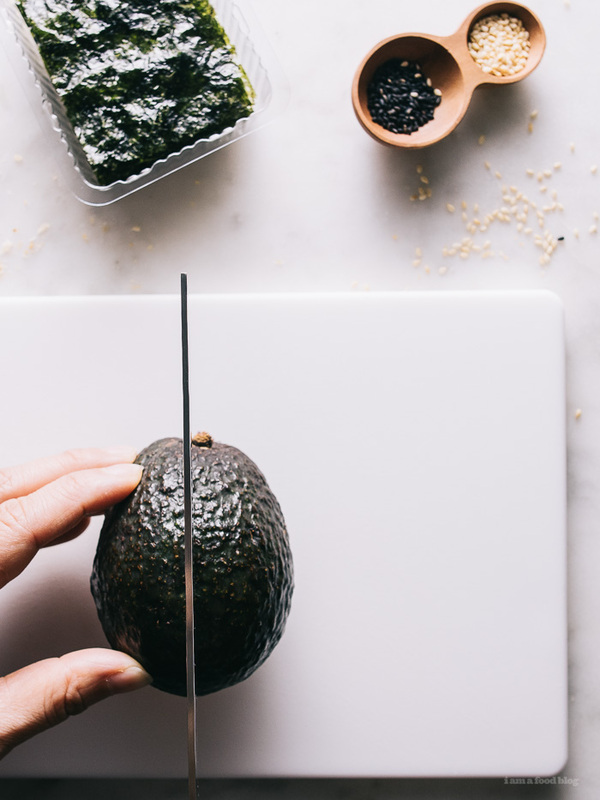 Japanese combined with avocado? What could go wrong! This not only looks delicious, but is really beautifully presented. Now that I know this exists, I’m going to have to make this. Love it !! I have to give it a shot! 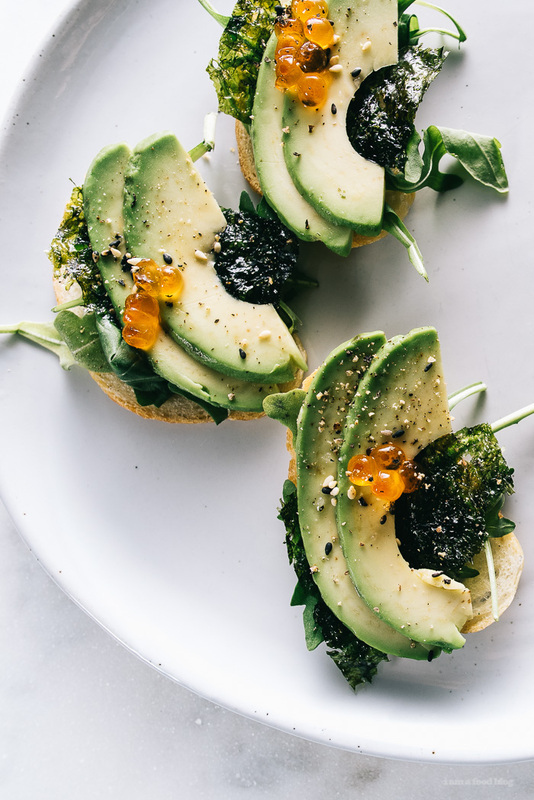 I personally love me some avocado…like all the time…and anything that has avocado in it or on it or even next to it… just the other day my husband looked extra appealing just because he was holding an avocado :P but love your unique Japanese version of avocado toast!